Happy Monday, Happy New Year and Happy Back To The Grind! 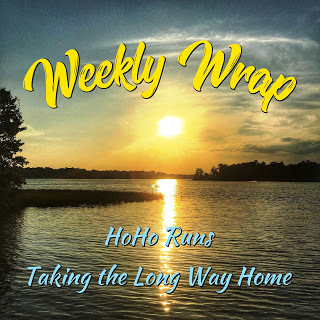 It’s time for the Weekly Wrap with HoHo Runs and Taking The Long Way Home! This was a tough week, all the way around. From the crazy weather, to not feeling my best, to some sad losses and events, I wasn’t operating at 100%. It’s ok. Life happens sometimes, and I believe in honoring those curveballs and setbacks. Before I get started, let’s give a nod to January. It was a strong month. I came in at about 81 running miles, and after we got back from our Banner Elk vacation, I put in consistent non-running workouts, twice a week. This is huge: not only am I on track for 1000 miles this year, but I forgot how great strength training makes me feel. I was so very happy to rest on Sunday. The boys went to finish work on their Pinewood Derby cars, and after they got home, Mr PugRunner and I went on a date to a local Brazilian steakhouse. It was a wonderful meal, and we got some needed quality time. Rain drove us away from our run and into the gym. I hate having to be flexible like that, but there was no way I was dealing with thunder and lightning. We did two sets of five workouts, including wall ball, burpees and weights. In between sets, we had to burn 25 calories on the treadmill (which I accomplished quickly by boosting the incline and sprinting as fast as I could). There was no school, so little man spent the day with some friends, while I was at work. They did lots of running around, but also made a volcano. Yoga has found its way back into the training calendar. I have mixed feelings – I know it’s great for me and I do enjoy it, but I also don’t want it to interfere with strength training, and I would love at least one day where I don’t have to set the alarm for crazy early. Tuesdays are usually pretty chill in the evening, and we just worked on homework and my closet. It took a few days to get everything purged and sorted, but this is part of the end result. I’m still working, but I’m really happy with where it’s at. Since I hadn’t run since Saturday, it was pretty tough to get going, but we had miles to run, so we got it done. Having a rest day on a Thursday was a little unique. I wasn’t so sure I liked it, even if it was nice to get a little midweek break. I had intended to go to the movies, but got caught up with some stuff around the house, and finally just resigned myself to staying home. At our Cub Scouts meeting, we worked on wrapping up some of our final badges and answering last minute questions about the upcoming Pinewood Derby. I didn’t want to run on a Friday, but we got out and got it done. These ladies are always so great for motivation. First up, a PTA meeting. Afterwards, I had to pick up some gift cards so I treated myself to a nice lunch out. Our evening had gotten a little complicated: I was on call to help set up for Pinewood Derby setup, and Mr PugRunner needed to attend a wake, so S offered to bring little man to the movies with her kids and some other friends. I was so grateful for the help and really can’t get over how lucky we are to have such a fabulous village. Pinewood Derby Day! This is such a huge deal for our scouts, and I was feeling the pressure. I wasn’t in the role of den leader last year, and I really wanted it to be a great experience for my boys. Everyone participated in the race, and some of our den parents were absolutely vital in helping with last minute weigh-ins and adjustments. Our den, as the second oldest den, was responsible for posting the colors, leading the pledge and assisting with car catching and return. They were absolutely on task and on point, and when it was their turn to race, their sportsmanship was incredible. I was so proud of them, and I know all their parents were, too. At the end of the action, little man snagged third place in our den! He was thrilled! This is his second trophy in as many years, and he is already making notes for next year. After all that, my parents came back to the house and then we went out for Papa Bear’s birthday. I went for the full-on carbload, because I had a half marathon on Sunday morning. I realize it looks like a light running week, but I was gearing up for the Daytona Beach Half Marathon on Sunday, so don’t worry. I got my miles, and will be getting plenty more this week, with another back-to-back race weekend. After this week, I am definitely going to carve out some time for either a solo movie or a hair appointment. I need just a little bit of individual time to decompress. How was your week in training? Your January? What do you do when you need some time to yourself? Congrats on a great January and an awesome week of workouts. It was awesome. I didn’t love his car design and I Hated that his cutting job wasn’t on point so there was a split in the front, but he was so proud and happy with it, and it’s his project, so I let it go. So hard!!!! But at the end of the day, it was a solid car and a great race. Wow your closet looks amazing, can you come do mine???? Great job on an awesome January! TOni recently posted…NOW Foods Turns 50! It was really fairly easy. The pieces are ClosetMaid and we grabbed them at Home Depot. It was just gearing myself up to get it done. I spent an afternoon building and then a few days going through everything in my spare time. Your weeks are always so busy and full! I don’t know how you find the time to fit it all in. I don’t know either. I just keep on swimming. Or running, as it were. I feel like that’ show it always goes! I am going to try to stay on top of these. Your closet looks great! I’m working on mine, but I still have a ways to go. Congrats to your son on the derby prize! It’s a tough overhaul, but well worth it! Thanks! He was so happy! I wish I could go on a running trip with girlfriends when I need some me-time. But I’ll settle for a nice long run instead. I am lucky to get to do it.Travel (alone, with friends and with family) is a huge part of our lives, and I’m glad I can combine several things I love into one. Congrats toy you and tobyiur son! My son made Eagle last year – if the boys enjoy it, it really is a wonderful, character building journey! I do hope he continues to Eagle. I think it would be a really great accomplishment for him. He is talking about incorporating some other things into his life, and has even hinted about starting basketball or going back to baseball, so I guess we will see what happens. Sounds like a great week! If I need time, I usually workout, HA! It’s rare that I get much time to myself as my husband works shift work so when I do, I get outside for a run! My husband’s hours are all over the place, which is fine, but it means I’m the one responsible for homework and extracurriculars and meetings and whatnot. I’m an extroverted introvert, so I am ok with all the hustle and bustle, but every so often, I need to put on my pjs, sit down in a quiet house and just exist like that for a while. Congrats to the little man! I could go for a closer purge and sorting, too! It felt so good to just pull everything out and control what went back in. It’s been needed for a while and I’m so glad I finally did it. I’ve been wanted to go to the movies, but now that I have the crud, that won’t be happening anytime soon. It is definitely difficult to balance everything. And I think running should be light before a race! Another busy week! That derby sounds like a ton of fun, and I love that kids all supported each other. We did one of these in shop class when I was in middle school (everyone took shop at my school, boys AND girls! We were way ahead of our time…) And it was SO fun. I think my mom still has my car. We are starting biggest loser today at my work, so I see lots of miles in my future! Hopefully this will motivate me to get back out there REGULARLY! Hope you get some me time for yourself! I live by myself, so it’s pretty much all me time, unless you count the pugs. Your days seem so eventful and packed. You’re doing great. I’m so jealous of your closet. I can’t clean mine because my husband uses my closet as a junkdrawer for enormous objects. It sounds like a busy but fun week! Congrats on the success of the Pinewood Derby! Your closet looks incredible…I now have closet envy! I hope you had a great half marathon and look forward to your recap. Thanks for linking! That’s the name of the game around here! Busy but fun! The derby is always such an awesome time and I am so glad we have such fabulous parents and kids. Congrats on a successful derby! Your closet looks great! Way to go with the closet purging and organizing. I’m on a huge decluttering kick right now and am trying so hard to sell some things from around the house that we no longer need, and donate or throw out other things. I have so little patience for selling things. I’m really quite awful about it! However, it’s great to purge evey so often. I did half the kitchen cabinets and I will attack our storage closets. Soon. Oh, you are reminding me of how badly I need to purge my own closet! I keep meaning to request a bag from ThredUp and keep forgetting!